The “Baddest Man on the Planet” has announced that his next business venture will be in the cannabis industry. 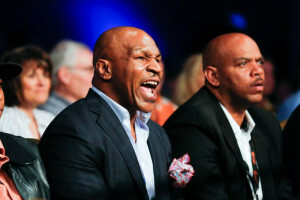 Former champion, Mike Tyson started off the New Year with a groundbreaking celebration on his 40-acre parcel of land in the small town of California City, California. “Tyson Ranch” is set to be a marijuana grower’s paradise. January 1, 2018 marked the legalization of recreational marijuana in California. Now patrons 21 and older can purchase marijuana for recreational use and grow up to six plants per individual. Only 90 recreational business licenses have been allotted at this point, which is a small number given the state’s population. The industry is expected to generate $3.7 billion in its first year and $5.1 billion in 2019. Tyson Ranch will be more than just a grow facility, though 20 acres are to be allotted for climate controlled cultivation. Tyson and partners Robert Hickman and Jay Strommen also plan on founding the “Tyson Cultivation School,” where people can take hands-on marijuana growing lessons from Tyson himself. The former boxer is a long time proponent for medical marijuana, which has been legal in California for over 20 years. Tyson Ranch plans to conduct research to further define the benefits of cannabis for medical use. There is even a strain of marijuana named after Tyson. After his career, Tyson admitted to using marijuana (an much harder drugs) during his matches. He tested positive after his October 2000 match against Andrew Golota, but has admitted to using the substance on multiple occasions. Many sports still have a zero-tolerance on marijuana, but some such as mixed martial arts are state specific with higher limits in states that have legalized cannabis. There is no word yet on an official opening, which may be a ways out considering that the ground has only now been broken. Tyson is not the only celebrity looking to get in on the “green rush.” Snoop Dog, Wiz Khalifa, Whoopie Goldberg, Woody Harrelson, Willie Nelson, Tommy Chong, Cliff Robinson, Richard Branson and Roseanne Barr are all on board with legalization of marijuana. Many have developed their own strains, contributed to research efforts or showed interest in opening their own dispensaries. With California entering the market, the possibilities will be open to a whole new market of celebrities, many of which may interested in a marijuana based business closer to home.